I have to admit outright that I know very little about Mose Allison (save "Look Here" from The Clash's "Sandinista!" album, "Young Man Blues" from The Who and Bonnie Raitt's "Everybody's Crying Mercy") and have this album because of the Van Morrison input, so I am basically seeing it from a Morrison point of view. He is joined here by pianist Ben Sidran and sometime sidekick in veteran jazzer Georgie Fame. 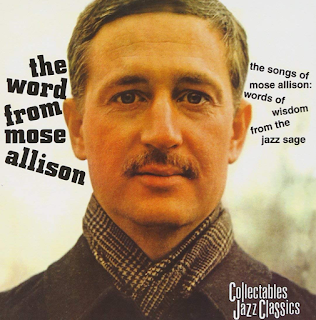 Mose Allison aficionados seem to be most affronted by this project, but, for me, listening to it from my position of comparative ignorance it sounds a fine, late night, jazzy album to me. As I said, though, I have no knowledge of the originals so take what I say with a reasonably large pinch of salt. (With that in mind, I have just listened to several Allison originals and they have a great sound, instrumentally, and he had a unique laid-back, smooth voice). I liked his tracks, for sure, and appreciate the authenticism of them but it certainly hasn't made me think any worse of this album. Georgie Fame is a highly credible jazz artist, for a start. A brief aside - I was surprised to see that Allison looked like a cross between George Orwell and Oswald Mosley (I had presumed him to be black). So, as from now, I am sampling the originals as well as the covers on this album. "One Of These Days" is an authentic blues grinder with Morrison on growling vocals, while "You Can Count On Me (To Do My Part)" is an upbeat, brass-driven bassy number with some great saxophone from longtime Morrison collaborator, Pee Wee Ellis. Pianist Ben Sidran's "If You Live" features himself on suitably, deep, smoky vocals, where he sounds just like Georgie Fame. Fame is on vocal duties himself on "Was", which is so "late night" as to be almost comatose. It is atmospheric in buckets though. Fame's voice sounds almost identical to Allison's. Sidran's take on the afore-mentioned "Look Here" is soulfully jazzy, rhythmic and less frenetic than The Clash's version. Fame's "City Home" continues the laid-back, late night urban late 1950s groove. "No Trouble Living" has Sidran finding his own inner Georgie Fame once again. All three of them seem to sing on "Benediction", although Morrison is the dominant voice. I do like this one, but I prefer Allison's original, with its lighter tones and vocal delivery. "Back On The Corner" is a lively, jaunty Georgie Fame, organ-driven number with some great bass and piano too. 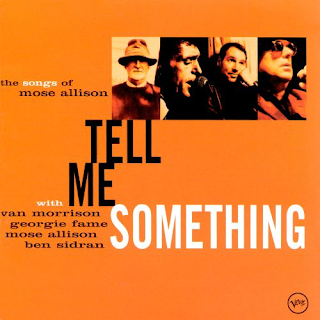 "Tell Me Something" sees Van return, and, in my opinion he does impressively - it is full of bluesy atmosphere and killer saxophone. I love it. Allison's version is superb but Morrison gives it something too, I feel. "I Don't Want Much" is tackled very well by Fame and Sidran. Actually, I prefer their interpretation to Allison's original. The virtuoso saxophone parts on Allison's originals, are, however, truly outstanding. Back to this album, however - "News Nightclub" is impossibly catchy. "Perfect Moment" is a tender slow piano backed number to end on. Taking this album on face value - did I enjoy listening to it or not? I did.